OMGosh talk about a total blast!! It had been a few years since our last visit to the MNRF--pre youngest DS & he's almost 5 1/2!! The sites, sounds, smells, merchants, entertainment & you can't forget the food (the yummy delicious food!!) it is almost more than you can take in!! If you have never been to a Renaissance Festival & are given the chance you HAVE TO GO!! This was the 37th year of the festival and it is one of the largest in the country. When you walk through the entrance it will take you back in time to the 16th century!! It is tucked away in a wooded area in Shakopee, MN on 22 acres, like a little hidden city from time passed. There is jousting, belly dancers, wenches, muses, gypsies, the royal court along with the king & queen, stockades and numerous street entertainment!! This was also an extra special day because 8 years ago Eric & I went to the MNRF on our very 1st date!! I have been having so much fun playing with the new SU Haunting Halloween stamp set!! I Love Halloween!! This set is so cute & I just couldn't resist putting the goggle eyes on the little frog! Isn't he cute? I used SU pastels (chalks) to color in all of the images. Then to give them a little bling I added touches of shimmer with Gelly Roll Glitter pens, SU Dazzling Diamond Glitter & Souffle pens. I also used (SU) Crystal Effects along with three different colors of SU dye ink to create a green glaze for the bubbles brewing in the pot. 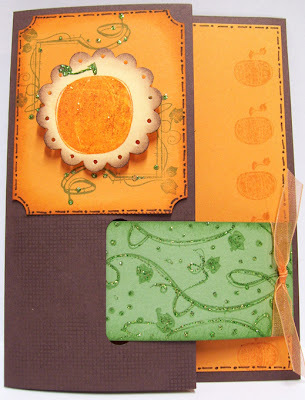 The background pieces was made using the Cuttlebug Spots & Dots Embossing Folder & the Wizard die cut and embossing machine. Just a side note--we had a wonderful time this weekend!! Eric & I went to the MN Renaissance Festival & had a total blast!!! I wanted to share some pictures with you but I am having some issues with the computer--it won't let do what I want it to!! lol! I will try and get them posted asap but in the meantime if you are interested in seeing some pictures from the MNRF website HERE is a link to the MN Renaissance Festival and once you click on the link look to the right side--it will say click here to view the 2007 Brochure--if you click that you can see some pictures from the festival. Hope to be able to share this with you soon!! I hope you all had a wonderful weekend & a great start to a new week!! You know I think it has taken me longer to think of what title to use for this post than it did to make the cards! lol! 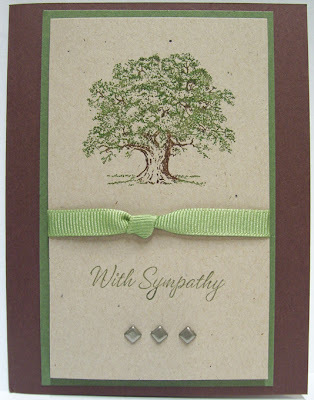 Recently I have been working on Sympathy cards and I don't know why but I have a hard time making them. I guess in the back of my mind I am hoping and praying that I won't be needing them anytime soon. 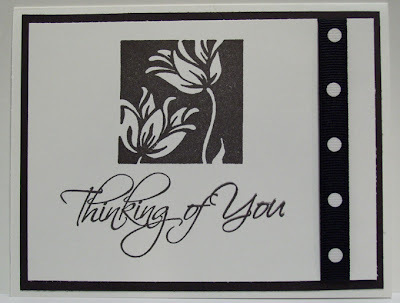 Do any of you have a hard time with sympathy cards? This is the 1st card that I designed. I like them both but I think the 1st one is my favorite--I just love the oak tree stamp!! Thanks so much for stopping by & I hope you had a wonderful Wednesday! My 1st Halloween card of the year. I had a little time this morning to play around with one of my new SU sets -- Autumn Apparitions. What a fun set!! I also had fun playing with my punches. 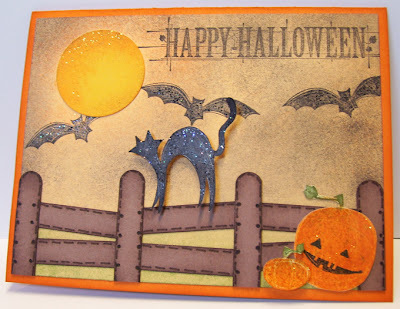 I used the Word Window punch and the 1-3/8 Circle punch to create the fence & moon. First I punched out the Circle and placed it onto the CS, sponged Groovy Guava & Pumpkin Pie around the moon, then Basic Black over the rest of the sky. Then I stippled Wild Wasabi along the bottom of the card front. I took off the circle punch & then stamped the bats & sentiment. When I put the moon back on I adhered it just slightly down from the stipple circle, this left a little sliver of Apricot Appeal. For the fence I used the Word Window punch, sponged the edges & outlined with the marker. Lastly I added the cat & pumpkins & some stickles. For the small pumpkin & the cat I used popdots. Thanks for stopping by!! I hope you are having a great Monday!! Another Birthday for a teenage boy & I was in need of a card! 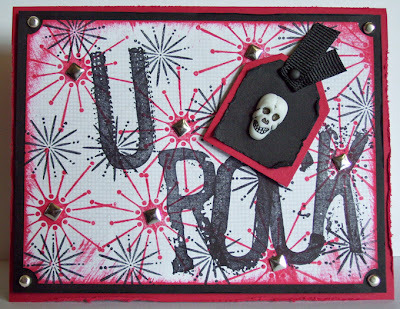 The 1st U ROCK card that I designed went over Great with the young man who received it so I thought I would make another one. I didn't want it to look exactly the same & I was trying to think a little outside of the box, I wanted to have a really cool background. Then it hit me--the new SU Snow Burst Stamp Set would make an awesome background!! So that's what I went with & here is the result. What do you think? Today is the 1st day that I have been migraine free since Sunday!! Woo-hoo!! I was hoping and praying that I would feel better today since I had a class tonight. This is going to be a quick post but I wanted to share with you what we did in class. This is the 1st card that we did. 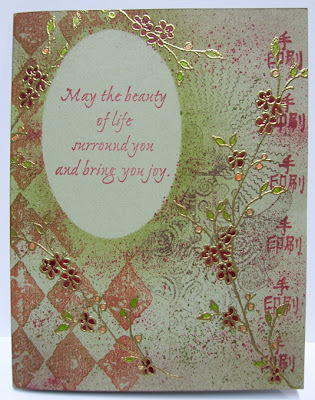 I know if you come to my blog on a regular basis you have already seen this card from an earlier post. But after one of the ladies (Miriam) that comes to classes seen this card she asked if we could do it for class. All of the info for the card can be found here. This is the 2nd card that we made. I think this one was a favorite for the night! The technique is called Iris Folding. 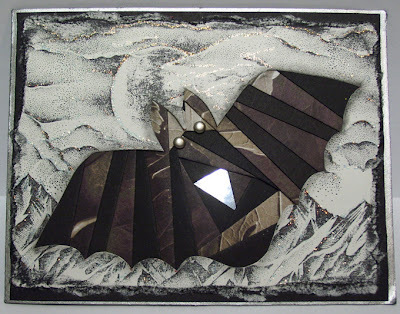 The pattern for the bat came from Circle of Crafters. They have several patterns for iris folding along with complete instructions. They also have a monthly newsletter with free patterns. This is the 3rd card that we made tonight. These buckle cards are so fun to make and I got to use one of my new sets! Like I said this is going to be a quick one tonight! I will come back tomorrow and add all of the info (stamps, paper, ink...) to the post. Thanks so much for stopping by! I am hoping I can get caught up on everyone's blogs in the next day or two!! Hope you are having a great week! It's almost the weekend!! Sorry I haven't been around for a few days! I have been battling it out with migraines since this last Sunday!! Oh I wish they would just go away!! It gets to the point where any little noise just makes you cringe. If you haven't ever had a migraine consider yourself very lucky and if you have had them then you know exactly what I'm taking about. So needless to say it has been a really slow going week around here. I have a class tomorrow so I am hoping I can get through the day without a migraine. 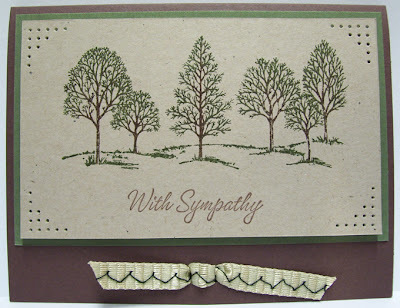 The only thing I have been working on this week is making some sympathy cards and getting ready for class. I only have one card to share with you tonight. It isn't a new card but I have made a ton of these and I have taught a few classes on making them. It's one of my favorites!! For the base of this card I used a full sheet of CS folded in half and scored. To design this picture I used several stamps and also did a little bit of masking. All of the stamps except for the wold are stampscapes stamps. 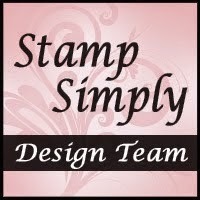 They are very easy to work with and what I would call very user friendly stamps. Like I said I did a little bit of masking, mostly over the wolf. But for the most part the way these stamps are made there is very little masking involved in layering the images. After I was done with all of the stamping then I use chalks to color in the design and I applied crystal effects over the areas of water to give it a wet look. 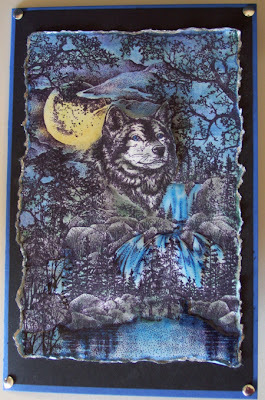 I also used a craft knife to cut around the top part of the wolf and then used popdots to raise it up just a little. Here are two of the cards that we did for the make-n-takes. This was a fun card to make! 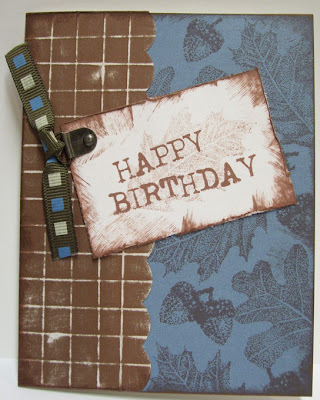 Peggy showed us how you can use a scoring blade with your cutter to make a grid on your CS. Then you sand the paper so the white core shows through. I love the CS with the white core!! This is a great birthday card for the fall. Here is the 2nd card that we made. I love the simplicity of this card! It is so crisp looking. Here is another card that I made. I wish I could get a better picture of it! I used perfect pearls on it and I'm not sure how many pictures I took but it just wasn't showing up! To achieve the background I used several different colors of ink for the watercolor. Today wasn't the greatest, I spent most of the day in bed. I woke up with a migraine and it just wouldn't go away!! I got up and started getting ready for church but it just kept getting worse. So Eric took the boys to church and I went back to bed. I couldn't believe it when I woke up I thought maybe it was around noon, it was almost 4 o'clock!! I couldn't believe I slept that long!!! Even though I slept that long the migraine was still hanging on!! It wasn't until about 8-8:30 it went away. I haven't had one that bad in a long time. Other than that not too much has been going on around here. Just getting ready to start another week. Both of the boys had a really great 1st week of school! Hope you all have a really great week and thanks so much for stopping by! 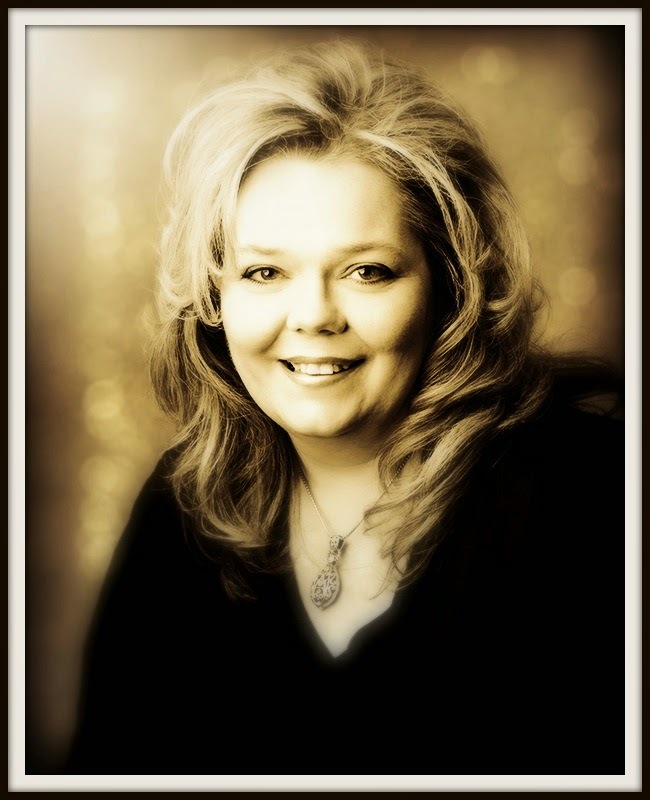 Where do you get your inspiration from? For myself I know that I draw inspiration from so many things in life~my husband, kids, family, friends, nature & the list could go on & on!! Recently I was in a swap at Art Happens and what a challenge!! We did a NO LAYERS swap. Sounds easy enough, right? Well think again!! LOL! OMGosh I think it is so much harder to come up with a design this way then if someone handed you a stack of papers and told you to use whatever you wanted!! I had several failed attempts before I came up with the right design but I am very pleased with the end result. What was my inspiration? Beads. 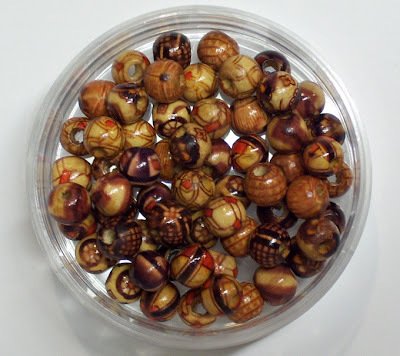 These are printed wooden beads from my stash. Here is my card that was inspired by the beads. 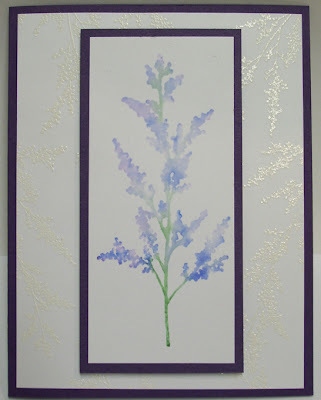 I layered five different stamps, did masking, sponged, stippled, spritz, embossed, painted with twinkling H2O's and use only one piece of card stock! Thank you so much for stopping by! I hope you all have a wonderful weekend full of inspiration!! Busy Busy!! Today is one of those days where every second counts!! I have a class tonight that I am getting ready for and I wanted to make a quick post to share with you what we will be making. 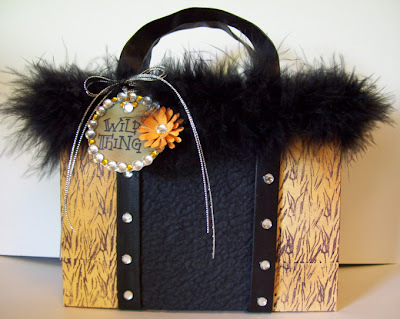 We will be making this little Tiger Tote along with four matching cards and envies. I just adore this little tote!! These are so fun to make and you can fill them up with all kinds of little goodies or a matching set of cards. Sorry I don't have a picture available for the cards (I haven't taken pictures of them yet). Stamp~Tiger Print Background (sorry the company is no longer in business but you would be able to use just about any kind of tiger print for the background). 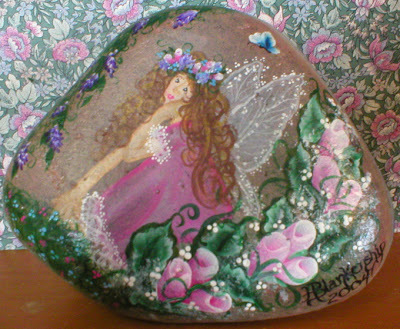 I haven't done any stamping for a few days but I have been spending some time on another hobby of mine-painting. Back in June I posted a heart that I painted for my cousin, her little girl passed away after many struggles in her short little life. 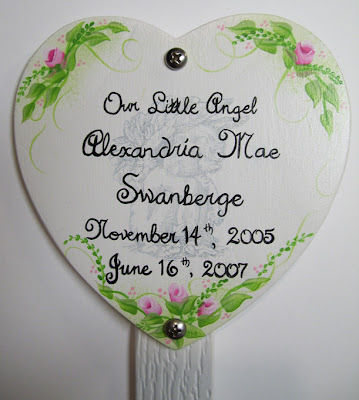 One of the times that she was in the hospital the nurses had made a keepsake heart for her Mom and Dad and they asked me if I could paint it. They wanted to have it on a table with pictures of her. I think it was one of the hardest (emotionally) thing I have ever had to paint! Last week my uncle (Alex's Grandpa) called to see if I could paint a marker that he had made for out at the cemetery. He made a heart shaped marker and he wanted to surprise them by having me paint it. I thought that was so sweet!! The day went great for both of the boys!! Our youngest DS had a BLAST and is so excited that he gets to go back tomorrow!! He even brought his 1st paper home to put on the frig! He was so proud-he got them all right and had a big star on his paper!! I love that he is so excited!!! Our oldest DS had a great day too!! He said he really likes his teachers-they are so COOL! Also he didn't get lost at the new HS-which is a huge plus-lol!! A bunch of his older friends were teasing him today, when he came home from school he said I've already been picked up and carried through the school--he was laughing so hard when he was telling me all about it! The joys of HS!! I really enjoyed my day but it felt a little strange not having them here. One of my GF told me--oh that will pass--LOL!! Fun, Exciting, Happy (& a little sad)--so many emotions!! Today is the 1st day of school! We have one starting High School and one starting Kindergarten!! Just wanted to share a couple pictures and some thoughts. I always take pictures on the 1st day of school. Our Oldest tried to sneak out and get in the car this morning to avoid the pictures! He always say "oh mom!" and then there is our youngest who can't wait to have his picture taken! 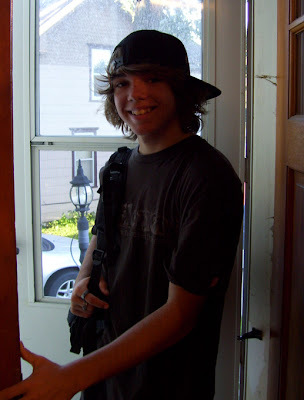 Our oldest is in 9th grade. I think he was excited and maybe a little nervous too, but I know he'll never admit it-lol! They have to be so cool--ya know! I am excited for him and I hope he has many great high school experiences!! But then the mother in me is a little sad too knowing that the next four years is going to fly by and before I know it he will be all grown up. Our youngest started Kindergarten today!! He was soooooo excited!!! He told me, "Oh I'm so excited, I've waited my whole life for this day!!" He didn't seem nervous one little bit, he was ready to go! 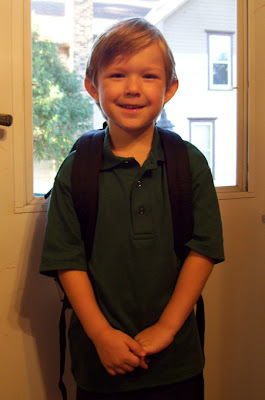 On the way to school this morning he said, "Mommy I'm going to miss you today." Fighting back the tears I said, "I'm going to miss you too!" Where does the time go? Don't blink--they grow up so fast!! I hope for all of you with children in school that you have a great year! !